Looking for a different investment? At first, the idea of cemetery investment might seem odd or macabre. But the demand for cemetery space in the UK is growing faster than supply. The result is that these sites are increasing in value at increased rates while other property sectors are standing still. As Brickowner launches the UK’s first crowdfunded cemetery investment we look at some of the reasons why a cemetery investment can prove profitable. Most property developments add value to the land, through planning gains and creating useful assets, the right developer will provide the same level of expertise to new cemeteries ensuring that legislation is fully adhered too, they are built in the right area, and meet the needs of the local population. Demand for burial space in the UK is high and creating a cemetery in the right area people are able to have the funeral they want. As ever, any good property developer should never purely rely on market performance both property managers and property developers try to add value by developing the land, this also applies to cemeteries. 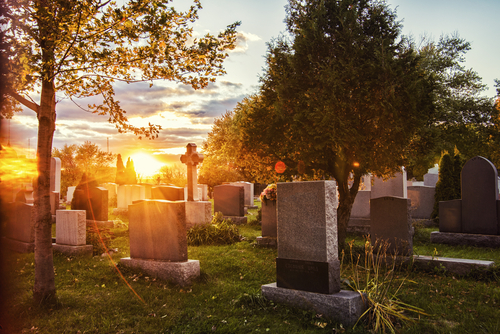 We all know “death and taxes” are two certainties in life, in England and Wales with 500,000 deaths per year and 17% of the population wanting to be buried, 85,000 new burial plots need to be found annually. Morbid as it may sound, the certainty of death grants a steady and perpetual market for cemeteries, unlike other investments that can be affected by external markets. We are all aware of the housing crisis caused by ever-increasing population and limited land to build houses resulting in high demand for homes making property development attractive to investors. In many ways, the same principals can be applied to the development of cemeteries. As mentioned earlier around 85,000 plots will need to be created each year. With roughly 1250 plots being created per acre around 70 acres a year need to be dedicated to cemetery development, or an area the size of the City of London every ten years. This has resulted in a national shortage of grave space. A BBC survey with 358 local authorities in 2013 stated that “almost half of England’s cemeteries could run out of space within the next 20 years”, with a quarter of the 358 local authorities responding they that would have no more room for burials within a decade. The limited availability of land and complex planning laws help ensure that cemetery investments hold their value and will prevent the over saturation of the market for the foreseeable future. Property crowdfunding has opened and democratised property investment for all due to lower minimum investment amounts. In the past property investment required sizeable minimum investment amounts preventing many from investing. Prop tech and crowdfunding changed this, and now for the first time, this has been applied to cemetery investment via Brickowner.